If not for agastache’s manifold attractive qualities, growers and landscapers may have given up on this sun-loving flowering perennial long ago for its finicky and sometimes sprawling growth habit. Agastache has endured as a garden favorite with growers and landscapers because it checks off so many boxes even without breeding. It has fragrant foliage, abundant and long-lasting blooms, and heat- and deer-tolerant qualities. It even serves a significant role in pollinator-friendly gardens. That’s only for starters. As breeders more recently have begun to focus on better selections to enhance appeal, including some with a trimmer build and a shorter stature, newer introductions expand the possibilities for agastache’s placement in the garden as both a short-lived perennial and a splashy annual. Agastache is native to North America and parts of Asia. Its name derives from the Greek word “stáchys,” meaning “ear of grain,” for its dense, terminal spikes of two-lipped flowers and opposite toothed leaves that give it the look of a mature stalk of grain. Commonly known as hyssop, anise hyssop or hummingbird mint, this genus of about 30 aromatic species includes Agastache foeniculum, native to North America; A. rugosa from China and Japan; and A. aurantiaca from Mexico. Blooming Nursery in Cornelius, Oregon sells 24 varieties of agastache, but started out nearly 35 years ago selling only two kinds of the plant. Over the years, owner Grace Dinsdale has culled through the better producers to give as many tried-and-true selections as possible, said Ron Guilford, manager at Blooming Junction retail garden center (an arm of the nursery). Independent garden centers buy all of the 24 varieties at wholesale volume from Blooming Nursery. 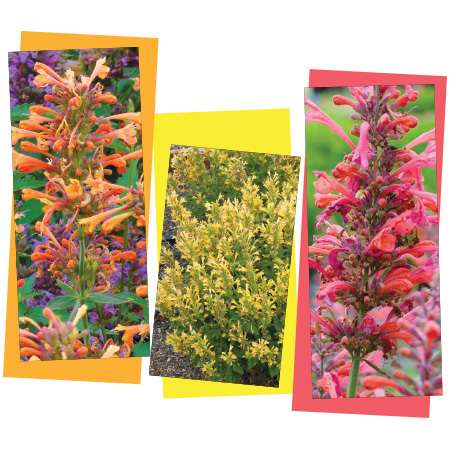 At the Blooming Junction garden center, unless the plant is in bloom, customers might bypass agastache. A home gardener is frequently looking at showy plants in real time and often in a 4-inch pot. However, the display garden is where Blooming Junction plants agastache in large swaths, making it an important part of introducing retail customers to their value. Staff recommendations are also important when introducing customers to the varieties, as are good photographs of the plant in full bloom. A big draw of agastache is the scented foliage, so Guilford never misses an opportunity throughout the day to purposely run his hands through the plant to release its heady scent. Overall, the taller varieties that are planted en masse to put on a show sell better than the shorter ones, although that might change given the smaller spaces people are growing in, Guilford said. A. ‘Blue Boa’ is one of Guilford’s favorites, mainly because of its intensely deep violet flower with substantial blooms on 2–3 foot spikes. It is one of the nursery’s top three sellers. Other popular selections are A. ‘Cotton Candy’, with a fast-growing, compact 24-inch by 18-inch habit with bubble-gum scented foliage and airy, showy, light pink flower spikes, as well as A. aurantiaca ‘Navajo Sunset’, with citrus-scented foliage and bright orange-red tubular flowers that last all summer. A. rupestris, commonly known as threadleaf giant hyssop, is another favorite of Guilfold. Kate Bryant, a Portland-based container and garden designer, also uses them even though the unhybridized ones can be “rambunctious, rambling plants,” she said. Bryant has always grown agastache in her personal garden. It was one of the first plants she experimented with and she eagerly incorporates it into the container designs and plantings she does for her clients. According to the designer, the trick with agastache is educating customers on its ideal growing conditions and its status as a short-lived perennial that endures only a few years in the Northwest, or as a sturdy annual. If planted in dense, soggy soils, agastache will produce long stems that will split and flop over. The new growth can be headed back, but in general, it is better to place the plant in unamended, well-drained soils with a gravel mulch where they will live longer. Otherwise, gardeners can enjoy its “voluptuous growth habit” as an annual, Bryant said. Native to Arizona, New Mexico and parts of Mexico, A. rupestris — introduced by High County Gardens of Shelburne, Vermont in the 1990s — has fine, licorice-and-mint scented foliage and smoky purple buds that open to apricot tubular flowers with lavender calyxes. Its habitat is mineral-rich, well-drained soil. With that pedigree, it is a tough plant that can take lots of sun. It’s a favorite and a hot item at Walla Walla Nursery in Walla Walla, Washington, which sells double the number of A. rupestris than any other agastache variety. “It is a huge, unwieldy plant, so it is important to give it space and sunshine — like in a hot, dry, well-drained position in the open garden,” Bryant said. Agastache can be ideal when you need a plant to fill a new garden in quickly. “A 4-inch plant can be a 2-foot by 2-foot plant a year later or late the following summer,” Bryant said. A. rupestris is a perfect fit if you treat it like something that will fade away as the garden gets mature and other plants begin to steal the sunlight. Most agastache can work even better as a seasonal plant in container gardens, eliminating the worries of them aging in place. “They go in and provide a big splash, growing from a small to massive plant in the course of one growing season, providing a show with hummingbirds, butterflies, pollinating insects — and great beauty,” Bryant said. Finding ways to grow high-quality agastache has been as much of an experiment for growers as it has been for gardeners — but the growers are trying to do it in quantity, too. 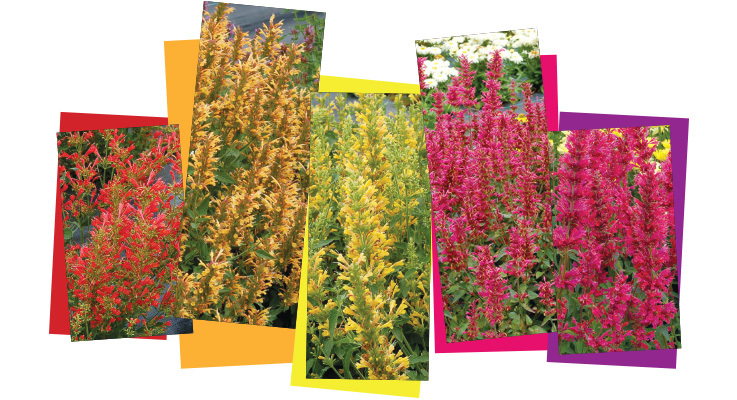 Throughout its 20 years of growing agastache, Walla Walla Nursery has tested as many as 26 varieties. Its current selection is narrowed to 13 that are good quality container plants for the market, according to Mike Richardson, production manager. Walla Walla Nursery grows between 10,000 and 13,000 plants per season in 3.5-inch pots and 1-gallon pots in early spring, late spring and summer to ensure availability. The nursery location is on the colder side of the plant’s hardiness range, so it’s not uncommon to use frost blankets or snow for insulation, depending on the weather. For instance, the Kudos™ series from Terra Nova Nurseries in Canby, Oregon, with its long bloom season and compact stature of 17–20 inches are attractive for container growers. They burst with color — gold, yellow, pink and purple — as do the compact A. ‘Bolero’ and A. ‘Mango Tango’ from Walters Gardens in Zeeland, Michigan. Nonetheless, the older genetics that include the native A. foeniculum and A. rupestris, should not be overlooked. They provide dynamic interest in mixed plantings, borders and containers, and are impressive as slightly larger, taller specimen-type plants in both the landscape and containers. Like A. ‘Ava’ from High Country Gardens, which reaches 5 feet tall with spikes of deep, rose-pink flowers held by raspberry-colored calyxes, or A. ‘Blue Blazes’ which grows to 4 feet tall with long-blooming lavender purple flowers from mid summer through fall. Deborah Whigham — owner of Digging Dog Nursery, a mail-order specialty nursery in Albion, California — does mostly cuttings. Growing agastache in a warm, sunny greenhouse closed against the cold is a challenge because they like good air circulation. Digging Dog Nursery grows agastache in Anderson pots, 3 inches square by 5.5 inches deep, with an open bottom. Any literature will tell you it’s hard to get them to overwinter, which is why she’s excited about A. ‘Blue Boa’. It is supposed to be more winter hardy. Her favorite is A. ‘Black Adder’, an introduction by Coen Jansen Nursery in The Netherlands, which she’s had success with both in the greenhouse and in sales. 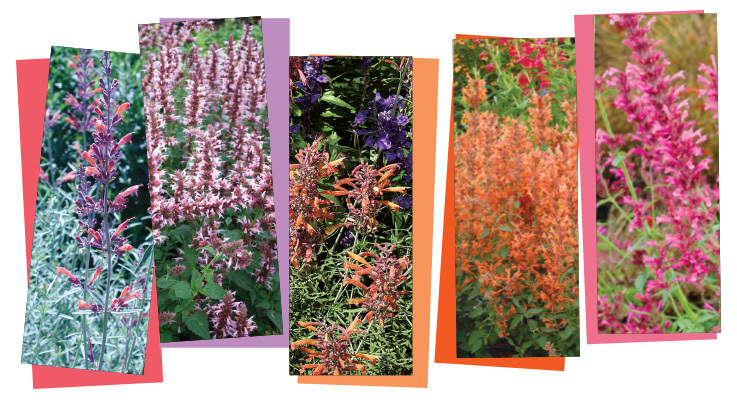 Although the blue and purple agastache are easier to grow, Whigham said, the pinks and reds are more popular. Two of her best-sellers are A. ‘Rosy Giant’, a 4–5 foot tall and less winter hardy variety, and A. mexicana ‘Sangria’ reaching 3–4 feet tall with red-purple flowers and lemon-perfumed foliage used for tea. Whigham offers the prolific-blooming A. ‘Firebird’, with its mix of copper, coral, pink and red-hue flowers rising above a compact 2–3 foot tall plant. “Based on its Greek roots, that’s the proper pronunciation,” said Chuck Pavlich, director of new product development. 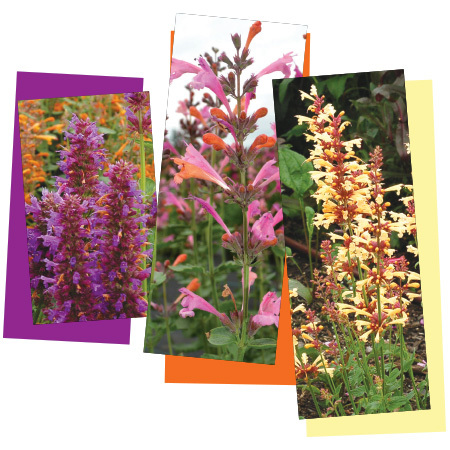 Terra Nova Nurseries released two popular series of agastache after breeder Janet Egger envisioned a better plant. Her goal was to have upright, well-branched background plants with distinct colors. The result was the taller Summer™ series released over a two-year period between 2007 and 2008, followed by the Kudos™ series in 2012-2013, in part to answer the call for more compact plants. By breeding with a little-known species from Eastern Oregon and the Rockies, A. cusickii, Egger was able to achieve even better results than expected. Yielding increased disease resistance for downy mildew, a problem for agastache in humid climates, and a genetic dwarf that needed no PGR as a pot crop. The plants have also increased hardiness to USDA hardiness zone 4. They come in a range of bright, distinct colors. A. ‘Morello’, another newer Terra Nova introduction launched in 2016, tops out at 33 inches in bloom, maintains the same hardiness as Kudos, and was immediately in demand. “It is such an unusual purple-y foliage in spring and summer with big bundles of cherry-juice flowers — large flowers, lots of them, in this unusual shade, a designer shade — and mildew resistant,” Pavlich said. Terra Nova Nurseries is introducing an even shorter series, Poquito™, that is a third more compact than Kudos and available in four colors. Pavlich said there will certainly be more colors. 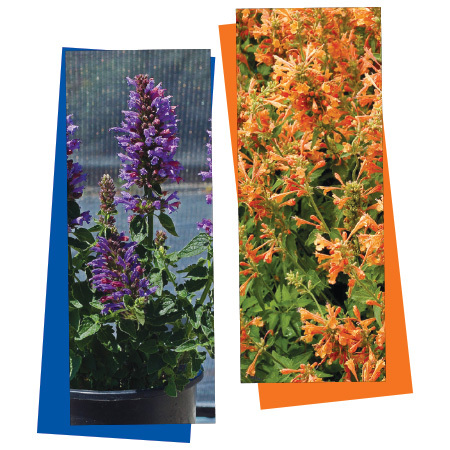 As agastache is gaining in popularity, the expectation is it will be increasingly more available from growers and desired by customers in the coming years.